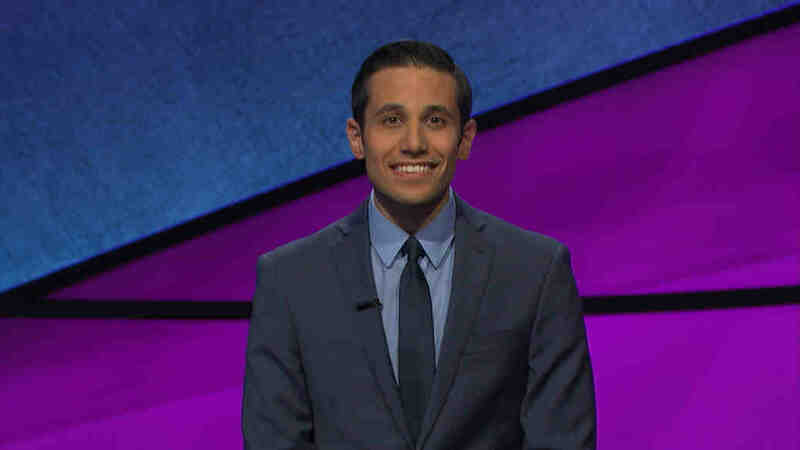 Frank Orlando, a political science instructor at Saint Leo University, has wanted to compete on Jeopardy ever since he was a little boy — and last month, his episode aired. It all began by passing the contestant exam in March, then proceeding to the in-person interview in Tampa in May. After that, he was included in the potential contestant pool. “At the end of October, I got a call from Los Angeles. They said, ‘Come on out, at the end of November. I said, “OK, I’ll be there,” he recalled. 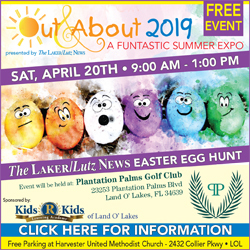 Being on the show was exciting, and sharing the experience with about 60 faculty, staff and students during a watch party at Saint Leo University was fun, said Orlando, who teaches undergraduate students and directs the Saint Leo Polling Institute. The experience on the national quiz show was similar to what he expected. In Jeopardy, contestants compete in three rounds, Jeopardy, Double Jeopardy and Final Jeopardy. They receive five clues in six categories, which are assigned dollar values based on perceived difficulty. Each contestant has a signaling device, which they use to buzz in to attempt a response, which must be made in the form of a question. Orlando said he has always enjoyed trivia. “I played Quiz Bowl growing up. I was the captain of our Quiz Bowl team,” he said, plus there’s a faculty trivia team from Saint Leo that plays together. He also has fond memories of watching Jeopardy with his grandparents. So for him, it was a sweet moment, indeed, when he heard the announcer say: “This is Jeopardy” during filming. The handheld signaling device, however, was not quite as thrilling, he said. “The buzzer is really a tough thing to get the timing down on. You can’t buzz in when you know the answer, you have to buzz in when the question is finished being read. There’s a person who manually opens up the buzzer system,” he said, and lights go on, which the players can see. “You read the question as fast as you can. You try to figure out the answer. And then you kind of wait for these lights to turn on (indicating that the buzzer has been activated). “Early on, I got a couple right in a row and I felt good about buzzing in, and then I think the other players got in a better rhythm,” he said. During his appearance, Orlando wore a blue suit, with a blue tie and a light blue shirt. He would have preferred wearing a green suit, to signify Saint Leo University and his undergraduate school, Michigan State University. But, green didn’t mesh with the set, so he couldn’t wear that. He prepared for the show by checking what he already knew. “I went through a lot of old archives of questions. I coded them for different categories: literature, music, television, sports,” he said. He felt confident about history, geography, political science, sports and music, so he focused on the categories of literature and art — primarily from around the time of the Renaissance. His studies paid off on a question in the category World through Literature. “My family is Italian. That really helped me out,” he said. But, he even though he focused on the arts and literature — it didn’t help him in Final Jeopardy. The question was in the category of Contemporary Art, not one of Orlando’s strengths. Still, he wasn’t entirely disappointed. 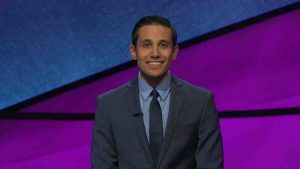 “One of my main goals was to at least make it to Final Jeopardy, and I accomplished that,” he said.